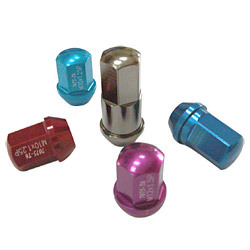 Industrial Valve, Tire Valve, Lug Nut, Wheel Lug Nut, Aluminum Alloy Tire Valve, Alloy Lug Nuts. 1. High tension, high torque. 4. The testing report revealed its tension is much higher than steel. The material we use is AL-7075-T6.